Everything, Everything is a 2017 American romantic drama film directed by Stella Meghie and written by J. Mills Goodloe, based on Nicola Yoon’s 2015 novel of the same name. The film follows a young woman named Maddy (Amandla Stenberg) who is prevented by virtue of illness from going outside her house, and her neighbor Olly (Nick Robinson) who wants to help her experience life. It was released on May 19, 2017, by Warner Bros. Pictures, received mixed reviews from critics and grossed $61 million worldwide. One day, a new family moves next door, and their son, who is Maddy's age, catches her eye. They share a look as Maddy watches through the window. Later that night, while Pauline and Maddy are watching a movie, the boy and his sister appear on their doorstep, offering a bundt cake. Pauline politely rejects it, and as she is about to close the door, the boy asks where her daughter is. Pauline lies and tells him Maddy is not home. It is also revealed that the father of the boy is violent and their relationship is strained. Later, the boy writes his number on his window for Maddy and soon they begin communicating through text. He introduces himself as Olly, and they text for a while, getting to know each other and eventually growing very fond of each other. Knowing her mother would not approve, Maddy convinces Carla to secretly let Olly visit her inside the house, though Carla makes them promise to stay on different sides of the room from each other. She later invites Olly over for the Fourth of July, since her mother is working that day. Maddy and Olly share a passionate kiss as fireworks go off outside. The next day, Maddy notices Olly fighting with his father outside. When his father shoves him to the ground, Maddy, to the shock of her mother, rushes outside to comfort Olly. Her mother rushes her back inside. Pauline deduces that Maddy and Olly have been seeing each other, and forbids their relationship. She later fires Carla for betraying her trust. Maddy decides that it is time to take matters into her own hands. With a credit card she had previously opened online, Maddy buys two plane tickets to Hawaii, and convinces Olly to travel there with her. In Hawaii, they share a romantic and life-changing experience together. During the trip, Maddy passes out and Olly rushes her to the hospital. She wakes up back in her bed at home. She breaks off contact with Olly due to the fact that she does not want to make another mistake over love again, and is therefore unable to say goodbye when his mother finally decides to leave his father. Olly, his mother, and sister leave back to New York, where they are from. A doctor from the hospital in Hawaii calls Maddy to give her an update, and tells Maddy that she does not have something as severe as SCID. Maddy scours her mother's records, and cannot find anything that indicates that she had ever been diagnosed with the disorder. She realizes that her mother has been lying to her for her whole life, and runs away from home. Maddy stays with Carla and Rosa. A doctor confirms that she has never had SCID, just an underdeveloped immune system from under-exposure due to living in filtered air her whole life. Her mother later tells her that after Maddy's father and brother died in a car crash, Maddy was all she had left and she wanted to protect her and keep her safe. Later she reunites with Olly in New York where they restart their romance. It is also implied that she and her mother begin to fix their relationship. Everything, Everything was released on May 19, 2017 by Warner Bros. Pictures and Metro-Goldwyn-Mayer Pictures. It was originally scheduled for August 18, 2017, but was moved up to its May date. Everything, Everything grossed $34.1 million in the United States and Canada and $27.5 million in other countries, for a worldwide total of $61.6 million, against a production budget of $10 million. In North America, the film was released alongside Alien: Covenant and Diary of a Wimpy Kid: The Long Haul, and was projected to gross $10–12 million from 2,801 theaters during its opening weekend. It made $525,000 from Thursday night previews and $4.7 million on its first day. It went on to open to $11.7 million, finishing 3rd at the box office. On Rotten Tomatoes, the film has an approval rating of 45% based on 112 reviews, with an average rating of 5.21/10. The website's critical consensus reads, "Everything, Everything should tug young adult heartstrings fairly effectively, but may not be quite engrossing enough to woo less melodramatically inclined viewers." On Metacritic, the film has a score of 52 out of 100, based on 26 critics, indicating "mixed or average reviews". Audiences polled by CinemaScore gave the film an average grade of "A−" on an A+ to F scale. The Immune Deficiency Foundation criticized the film as "erroneously misrepresenting [SCID] through worn stereotypes and misinformation," singling out in particular the film's use of Munchhausen-by-proxy as damaging to patients who actually have SCID. ^ a b c "Film releases". Variety Insight. Variety Media. Retrieved February 14, 2017. 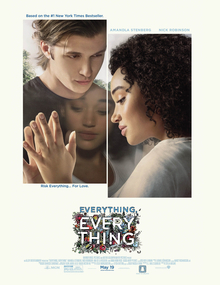 ^ "Everything, Everything". AMC Theatres. Retrieved April 28, 2017. ^ a b Faughnder, Ryan (May 16, 2017). "'Alien: Covenant,' No. 8 in the franchise, is poised to unseat 'Guardians' at the box office". Los Angeles Times. Retrieved June 26, 2018. ^ a b "Everything, Everything". Box Office Mojo. IMDb. Retrieved October 9, 2017. ^ Yoon, Nicola. "Everything, Everything". Nicola Yoon official website. Retrieved June 26, 2018. ^ "Everything, Everything With Amandla Stenberg & Nick Robinson". What's Filming. September 6, 2016. Retrieved November 15, 2016. ^ Gittins, Susan (September 5, 2016). "NEW MOVIE: EVERYTHING EVERYTHING with Amandla Stenberg & Nick Robinson Starts Filming in Vancouver This Week". Hollywood North. Retrieved November 15, 2016. ^ D'Alessandro, Anthony (November 10, 2016). "Bradley Cooper-Lady Gaga Movie 'A Star Is Born' Gets 2018 Release Date". Deadline Hollywood. Penske Business Media. Retrieved November 15, 2016. ^ a b D'Alessandro, Anthony; Busch, Anita (May 23, 2017). "Why 'Alien: Covenant' Lost Its Bite At The B.O. With $36.1M Opening, -34% From 'Prometheus'". Deadline Hollywood. Penske Business Media. Retrieved June 26, 2018. ^ "Everything, Everything (2017)". Rotten Tomatoes. Fandango Media. Retrieved June 26, 2018. ^ "Everything, Everything Reviews". Metacritic. CBS Interactive. Retrieved October 9, 2017. ^ Nyren, Erin (May 19, 2017). "'Everything, Everything' Criticized for Inaccurate Portrayal of Immunodeficiency Disorder SCID". Variety. Penske Business Media. Retrieved April 2, 2018. ^ "IDF Statement on Everything, Everything". Immune Deficiency Foundation. Retrieved April 2, 2018.